If you are looking for the latest updates in the world of home equipment technology, here is another addition to your collection! 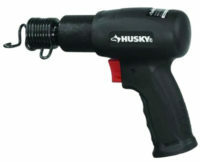 Husky Impact Wrench 1/2 in. 800 ft.-lbs. H4480 model features the latest hard hitting hammer that can produce 800 ft.-lb. of torque. This design is not yet featured in other brands and models so consider yourself lucky with Husky. With a high maximum torque, it is ideal for the removing and installing fasteners during auto/recreational vehicle/garden-agricultural equipment/machinery service and repair. Specifically, it works best for professional automotive techs and very tight fasteners and light truck lug nut removal. 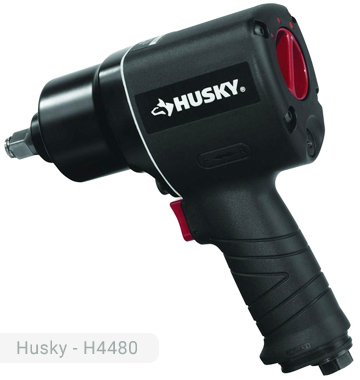 Husky Impact Wrench H4480 has a built-in one handed forward/reverse power management system that allows the user to maximize the speed and power of the tool to perform certain tasks. This model has an output of 1700 impacts per minute, a very efficient and fast rate. It has a maximum speed of 7000 rpm which adds to its power. These rates are perfect for all sorts of bolting projects in the garage or automotive shop. The recommended operating pressure is 90 psi. Because of its strong output, air consumption is at 4.4 CFM. Another distinct feature of this impact wrench is its internal silencing feature which reduces the noise that the tool produces. For users who want to have a quiet working environment, it is now possible with this unit. It has a ring type retainer to ensure that socket retention is secure. The holder is not too tight nor too loose. It has 3 variable power settings that can accommodate the needs of professionals who perform high-volume tasks. The power setting control knob is of high-quality and can be manipulated quickly. Husky 1/2 in. 800 ft.-lbs. 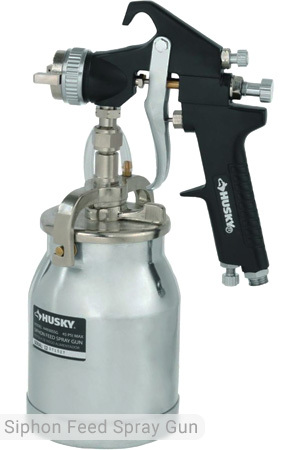 impact wrench will require an air compressor, for example Husky air compressor that has a total tank capacity of at least 20 gallons. The regulator should be set at 105 psi to allow the pressure to drop to 90 psi if you are using a 25 or 50″ x 3/8″ air hose. The 1/4″ inlet of the tool is the standard for all impact wrenches and can already provide the air that you need. The breakaway torque for this model is roughly estimated at 900-950 torque. 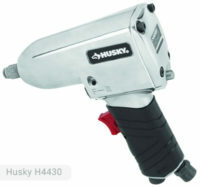 The low weight composite housing of this Husky impact wrench makes it very portable and provides durability. The total weight of the tool is 4.38 lbs. Although heavier than other models, it is still convenient to carry around and use for several hours a day. This unit is perfect for DIY mechanics who need to rotate tires of several cars a day, remove all sorts of lugs, and twist off bolts on the suspension parts of a truck. These can all be done with ease and comfort. For only $109.00, Husky 1/2 in. 800 ft.-lbs. Impact Wrench can be accessed in all leading home stores within your locality. If you want a guaranteed reliability and efficiency, purchase it now and see for yourself. Husky offers the latest technology that will surely make your jobs easier and faster to accomplish. If you already own Husky H4480 model or just want to buy it, feel free to share your review or ask a question through the form below. Husky Reactionless Ratchet, H4120 – 3/8 inches 80 ft. lbs. 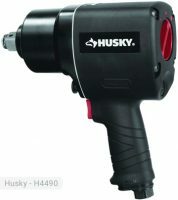 Husky Impact Wrench, H4430 – 1/2 inches 300 ft. -lbs. What are the foot pounds for the other levels? Not just the max, I’m running it at 90 psi out of a 3/8 hose.